During countless visits to maternity wards without safe water, what I hear time and time again are stories of trepidation – women who fear the very worst outcome for them and their newborn. Vitumbiko, 25, had heard stories about women dying during childbirth at her local health centre. She didn't tell anyone how worried she was, but was scared as she arrived, already having contractions. Her baby arrived safe and well, but the story isn't always this positive. Every minute around the world, a newborn baby tragically dies from an infection caused by dirty water and an unclean environment. Water and sanitation are human rights and essential to the provision of healthcare, and yet 844 million people around the world don't have clean water close to home. The problem extends beyond individuals and communities in remote or far flung locations, to healthcare facilities that see hundreds of patients every day. A 2015 WHO report found that one in three health centres in the developing world have no clean water. Last year, the reality of these statistics was brought to life for me when I took part in the Sleepover Challenge at Chinguluwe Health Centre in Ntchisi District, Malawi. The district has a nursing vacancy rate of 86%. Centres that see more than 200 patients each day make do with just one midwife and one doctor working all hours; their job is 24/7. Along with pressing problems around water, sanitation and hygiene, they have several other challenges which make the task at hand – treating patients and providing adequate healthcare - almost entirely impossible. We have now a critical moment to help change this deplorable situation. The Executive Board of the WHO meets in Geneva this week to determine the agenda for their 72nd annual meeting in May. Among their important items for consideration is a resolution on the need for every healthcare centre everywhere to have access to these essentials for care: water, sanitation and hygiene. 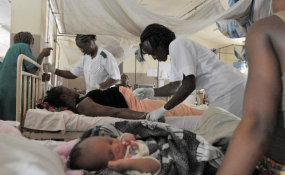 Without clean water, decent toilets and good hygiene, it's impossible for medical staff to deliver quality care, putting the lives of patients in danger and contributing to the spread of diseases and the rise of resistant infections, as antibiotics may be used to battle infections that good hygiene might have prevented. When staff are unable to keep the environment, their equipment or even their hands clean, vulnerable people are put at unnecessary risk.